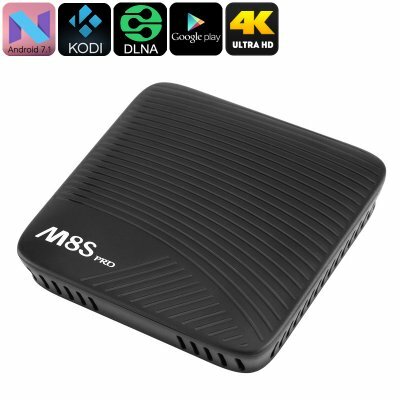 Successfully Added 4K TV Box Mecool M8S Pro - Android 7.1, Octa-Core CPU, 2GB DDR4 RAM, Google Play, Kodi TV, Airplay, Miracast, DLNA to your Shopping Cart. Meet the Mecool M8S Pro, a high-end Android TV box that brings a cinematic experience into any living room. Simply attach this 4K TV box to your regular HD TV, and you’ll be able to browse the web, play games, and watch your favorite movies as if you were using a true smart TV. With its Android 7.1 operating system, this Android TV box treats you with the latest software available on the market. Whether you simply like to sit back and enjoy a relaxing movie and gaming night at home or watch your favorite live sports games with your best friends – this 4K TV box has an answer to all your demands. Thanks to its 4K support, you’ll be able to undergo an absolutely stunning visual experience when this Android TV box is used with your 4K TV set. Increasing the visuals created by this Android TV even further is its ARM Mali T820MP3 GPU that allows you to engage in the most graphically demanding mobile games without experiencing any lag. With an Octa-Core processor in place and 2GB of DDR4 RAM – you’re guaranteed to undergo a powerful user experience. Play games, browse the web and watch the latest movies on your big screen TV. This stunning 4K TV box brings along tons of entertainment opportunities that are guaranteed to deliver years’ worth of fun into any household. Coming with 16GB of internal memory and the additional possibility to side in a 32GB SD card slot, there will be plenty of space for you to store all your favorite media. Access to Kodi TV and Google Play provides you with an unlimited pool of free entertainment – guaranteeing that you’ll never have to feel bored again. Supporting DLNA, you’ll be able to easily share files in between your different devices. Additional features like Miracast and Airplay further increase your overall user experience by letting you mirror all that’s happening on your Android or iOS device straight onto your big screen TV.